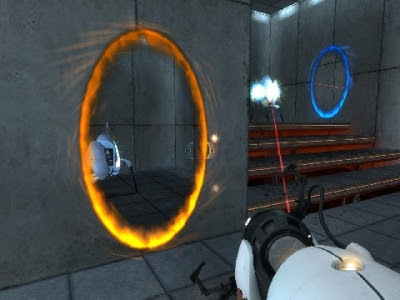 Playing a game that's nearly three years old could be described as retro but after failing to fall in love with Half Life's genius I'd avoided Portal charms and sold on my copy of The Orange Box some time ago. Luckily twitter came to my rescue and @KyeLani sent me her copy (admittedly some time ago) and after some pressure from others I finally found a day free to step into the shoes of the unnamed protagonist. 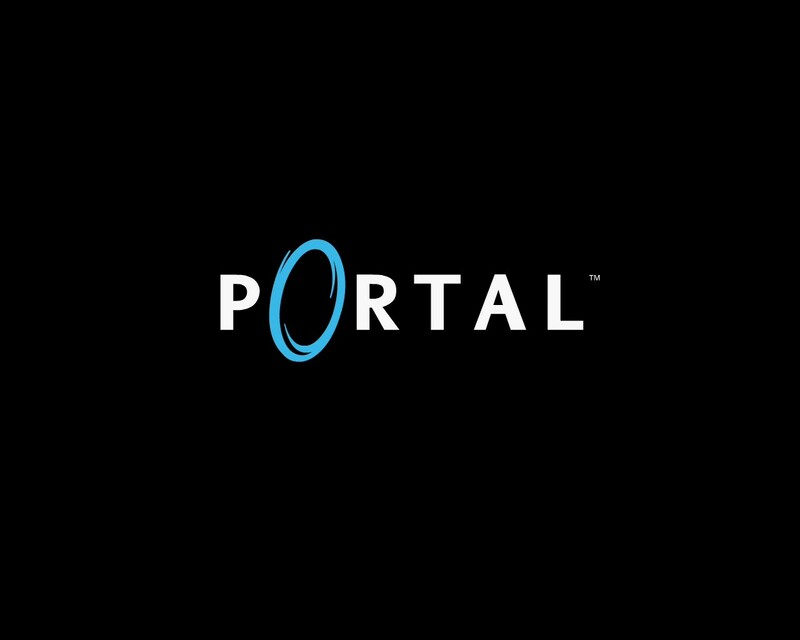 Portal is not easy to describe. Initially it feels like a straight puzzle game. You are guided by a female AI voice through a series of clinical looking chambers with each one increasing in difficulty. It weirdly reminded me of the Alistair Reynolds book Diamond Dogs although here the reward at your completion of the task is clear. Cake. Moving around each area is a done from a first person perspective and initially I felt the onset of motion sickness. I don't usually suffer and once I had the portal gun held in front of me I felt fine, I guess my wonky eyes needed some sort of bearing. The portal gun is the only piece of kit you have at your disposal but it's the cleverness of the games design that makes it such a joy to use. Fire one shot with the gun to create one opening and another to create the exit on almost any surface. How best to explain? Well say there's a high platform above you that you can't reach. Fire a portal into the ceiling above it and then one into the floor you are stood on. Step onto the one on the floor and you'll fall through the one on the ceiling and onto the platform. You can look through them too so you can see where you are going to end up. Clever stuff. The puzzles get more and more fiendish as the game goes on, although you will whip through the first 10 or so (there's 19 in all) without too much trouble. There's that traditional buzz of besting the game as each stage is completed and the AI voice, that gets more and more disturbing throughout, helps to add some tension as slowly but surely a narrative is revealed. It's here where the game excels beyond so many of it's counterparts, there's barely any cut scenes (there's one right at the end nit pickers), the story is allowed to breathe as you play. 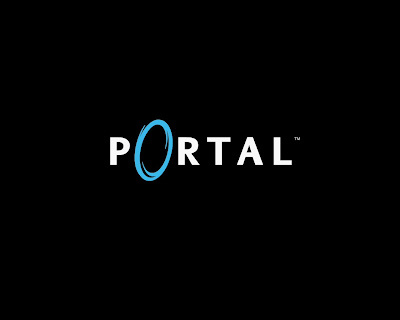 That's unusual, most games of this ilk will drag control away from you to move the story forward and that is not the case with Portal. Graphically it's not spectacular. Solid and functional at best, but the design still creates a great atmosphere, the sterile laboratory setting a stark contrast to the later part of the game. Gripes? I have a couple. The loading times aren't awful, but the frustration at having to reload each area after an unfortunate tumble into murky, toxic water can be very annoying. During the later stages the game's physics engine is almost too clever for its own good and it's very easy to get confused and disorientated as your flying through the air, trying to fire off a Portal to pass through, to build your momentum further in order to leap some distant gap. It's minor stuff though, the gameplay is up there with the best and the story, whilst subtle, is an endearing one that adds huge depth to what is essentially a puzzle game. The sequel comes along soon and I for one now understand why it's so eagerly awaited. I have to disagree about the disorientation caused by the 'over-smart' physics engine, though. I thought that *added* to the game because it was yet another thing you had to adjust to/overcome. I'm SO glad you enjoyed it though, Gray! and Congrats on getting to the cake! Wonderful work describing a simplybeautiful game, that, once you think you've beaten (the initial puzzles) pulls the curtain and takes you further into the workings of this amazing place. Oh, and the song at the end is beautiful too.